The midsize crossover segment is getting increasingly crowded and increasingly competitive these days, which is great news for anyone looking to buy one. Ford's contender in this important part of the market is the Edge, so let's put the 2017 Ford Edge vs 2017 Kia Sorento to see which comes out on top in a Ford vs Kia head-to-head comparison. The 2017 Ford Edge really could be used as a blueprint for any automaker thinking of entering the midsize crossover segment as it's hard to imagine who wouldn’t like the way it looks. It's understated and modest enough to avoid being polarizing, but it's also sporty and rugged enough to appeal to a huge audience. The Kia Sorento was completely redesigned only last year, the problem is the designers seemed to forget to update the exterior to any great degree. There's nothing terribly wrong with it, but its evolutionary approach looks a little dated at the side of the Edge, so the first part of our Edge vs Sorento contest goes to the Ford. Three-row duties in the Ford crossover family are left to the Explorer, so with only five seats there's a reasonable amount of room inside the 2017 Edge. The quality of the trim and materials is good but not class-leading, and there is a lack of the clever seating and storage solutions found in some competitors. If the Kia designers pretty much left the exterior alone last year, it's easy to see their efforts were instead concentrated on the interior. The Sorento isn’t a luxury vehicle, but it does have plenty of the in-cabin ambience and refinement of one, so this section has to go to the Kia. 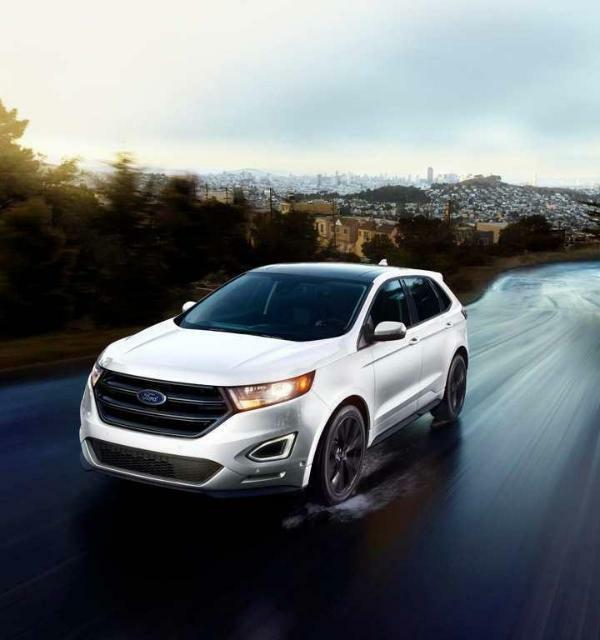 Both vehicles offer three different engine options, and in the case of the Ford Edge that means a 2.0-liter EcoBoost four-cylinder, a 3.5-liter naturally aspirated V-6 and a 2.7-liter EcoBoost V-6. The base 2.0-liter is standard with all but the Edge Sport, and it develops 245 horsepower and 275 lb.-ft. of torque. The most powerful unit is the 2.7-liter EcoBoost in the Edge Sport, and that one's good for 315 horsepower and 350 lb.-ft. The Sorento's standard powerplant is a 185 horsepower inline-four, and the most power the Kia can muster is 290 horsepower from a 3.3-liter V-6. This is an easy win for the Ford Edge then. The Edge and the Sorento are the kind of family haulers that are likely to cover a lot of miles in their lives, so fuel economy is going to be a consideration for a lot of buyers. The most fuel-efficient versions of the Edge are front-drive models with the 2.0-liter EcoBoost and auto stop/start, which are rated by the EPA at 21 mpg in the city, 29 mpg on the highway and 24 mpg combined. The best the Kia Sorento can manage is 21 mpg in the city, 28 mpg on the highway and 24 mpg combined, so our last test delivers the narrowest of victories for the Ford Edge. Kia has come a long way as a manufacturer in recent times, but the Sorento is a tale of two halves. The inside is excellent, but the exterior definitely lets the whole package down. The 2017 Ford Edge isn’t as spacious inside as the Kia, but it's got the Sorento beat in just about every other way so it's easily our winner here. The 2017 Ford Edge is available now, so check it out by getting in touch with the folks at Southern California Ford Dealers right away.